For more information on the race results of the 2018 GRSA Invitational Regatta- click here provided by Kate Gomes Invitational Chair. Race Committee Ross Stearns and Mark Mabry. Big thanks to Ross for helping out! We had a beautiful day of sailing, quite possibly the best of 2017. Sorry folks missed out. We had two fleets, Thistles and a Portsmouth handicap fleet with two Lasers and two Flying Scots. Race Committee Heather Swenson and Mark Mabry. Big thanks to Heather for helping out! 11 boats participated in this team race, 8 Brandermill Sailing Club boats and 3 GRSA boats. We launched three fleets: Flying Scots (5 boats), Thistles (3 boats), and Lasers (4 boats) and held three races. With fair winds building and three fleets on the course, it was a fantastic day of sailing at GRSA, followed by a great meal and a wonderful evening of fine weather, food, and friends. Below are the final results from the day. Special thanks to our amazing RC volunteers: Mike Hogeland, Ed Flanagan, and Ryan Flanagan! 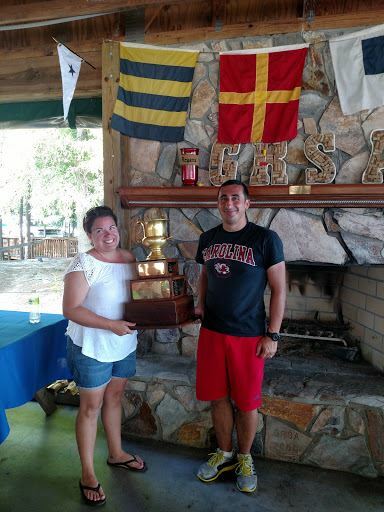 We invite everyone to join us for the Swift Creek Cup Regatta, Saturday September 17th, hosted by the Brandermill Sailing Club.